Had lunch with a colleague of mine this week. We went to this little cafe my boss is always raving about--The M&M Cafe, located on Michigan Ave. in Dearborn, Mich. Cozy lil' place. 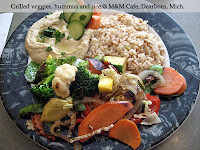 I ordered the grilled veggies, hummus and rice. Doesn't it look amazing? It tasted just as good as it looks! The meal and a glass of water came to $8.22, tax included. A word of note: the cafe does not accept credit cards. Many kudos to my buddy R for spotting me the cash for lunch. He's a lifesaver! I apologize that I can't report on the other veggie options available at the cafe; I was so engrossed in conversation with my friend that I didn't analyze the menu like I usually try to. My boss had given me the tip to order this particular dish, so I didn't look at the menu that closely. Never fear, though. I enjoyed this dish a lot, so I'm sure I'll be back there and I promise to give a better review at that time!